Here’s a look at the best exercise bikes to keep you active all year long! Whether you’ve committed to a “get fit” new years resolution or keeping up with an old one, exercise bikes are an excellent option for year-round fitness goals. Cycling is a low impact way to burn calories, allowing you to work up a sweat without stressing your joints. There are a few different types of exercise bikes out there, and each of them focuses on different muscles. Let’s cycle through the options! Upright bikes feature high handlebars to keep your posture in an upright position. This results in not just your legs getting a great workout, but your back and abdominal muscles, too! This Schwinn 170 Upright Bike has a wide variety of workout options, including 22 programs and 25 resistance levels to pick from. The 170 also features the latest technology for a modern workout, including a large LCD screen, built-in speakers, USB chargers, and even an adjustable fan! It’s a smart workout device, too, capable of connecting to your smartphones via Bluetooth to help track your fitness goals. You can also sync the machine with the free downloadable RideSocial app to virtually ride beside your friends in real time. The Fitness Reality 210 Upright Bike is an excellent choice for workouts without the noise. The machine features Quiet Drive technology, which reduces belt noise for noiseless and uninterrupted workout sessions. This stationary bike has 24 different resistance levels and 21 pre-set workouts that range from light to heavy intensity. An LCD display tracks your fitness progress by displaying distance, time, RPM, speed, and more! Recumbent bikes feature reclined seats that are lower to the ground, easing the pressure on your back. The focus on back support means these bikes are great for comfortable lower body workouts. The magnetic resistance of the Stamina 1350 Recumbent Bike promotes a smooth, quiet workout. The resistance level can be changed mid-workout via an adjustable knob, allowing for lighter or harder workouts. This recumbent bike features a padded and wrapped vinyl seat for a comfortable workout from start to finish. The semi-reclined frame also helps target hip, thigh, and gluteal muscles in your workout, too. A foldable recumbent bike is a good option if you’re pressed for space at home. This Sunny Health & Fitness foldable bike features a large padded seat and an adjustable backrest capable of supporting up to 265 lbs. Its digital monitor tracks pulse, speed, and distance to help keep you apprised of your fitness goals. Attached resistance bands for both arms and legs mean you can work on your muscle tone as well. This is quite a versatile, space-saving exercise bike! Using a spinner bike is much like using a traditional outdoor bicycle—the pedals keep going when you stop pedalling. These bikes feature lower handlebars encouraging you to lean forward, and you can lift out of your seat like you would in a spin class workout. Spinner bikes are often used by athletes or those preparing for a cycling race. The Exerpeutic LX7 Training Cycle is a great option for athletes in training. This spinner bike features multi-grip handlebars that let you adjust your position on the fly. It also comes with a 3-piece crank system to simulate road bike exercises, including uphill cycling and endurance training. A built-in display reads your pulse and speed, helping to keep your heart rate in the desired zone. This Sunny Health & Fitness spinner bike has a 30-pound flywheel that simulates real cycling motions. With its adjustable resistance settings, you can prepare for flat, uphill, or downhill riding. The seat and handlebars are also adjustable, enabling you to find a comfortable cycling position tailored to you. 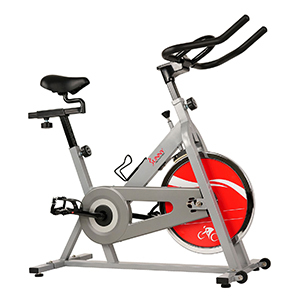 With a durable, heavy-duty steel frame and crank, this spinner bike will stand the test of time as you work to meet your fitness goals! Mini exercise bikes are great if you value portability or have limited space. These can be placed under a desk or chair and stored away in tight spaces afterwards. This Stamina Mini Exercise Bike can be placed under your cubical or in a storage closet after your workout. Its smooth pedal system eliminates jerky movements, giving you a smooth workout. You can even work out your arms by placing it on a table and pedalling with your hands. The large dial on the front lets you easily change resistance for harder or lighter workouts. Above the dial sits a workout monitor that tracks your workout time, calories burned, and stroke count. This electric exercise bike has a powerful motor with 12 different settings to assist your arm or leg workout. A handy remote control can also control workout settings like time, rotation, and speed. This bike is a great option for low impact exercises and for muscle rehabilitation. When it comes to exercise bikes, there are plenty of options to keep you pedalling year-round! From larger machines to space-saving foldable devices, exercise bikes are a great fitness investment. Good luck on your fitness journey!